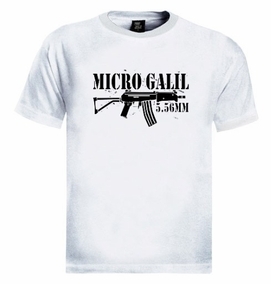 This 100% High-Quality Long Sleeve combed cotton T-Shirt is printed with the Micro Galil rifle image and it's parts scheme on front. There are three basic configurations of the 5.56mm Galil. The AR is equipped with a high-impact-plastic handguard without a bipod or carrying handle with the flash suppressor. The SAR is a short-barreled version of the AR model its gas tube and piston are shorter than the other models. While being a successful weapon, the Galil was not widely issued to the IDF during its lifetime, because during the late 1960s and early 1970s Israel received large shipments of the US M16 and CAR-15 assault rifles at the very low prices. M16 rifles became the major armament of the IDF, with the Galils mostly issued to the Armored corps, Artillery corps and some units of the Israeli Air Forces (Anti-Aircraft forces). Our t-shirts are made of 100% cotton and are long lasting with bright colors. Our products are all designed and printed in Israel.